Note#1: We crossed the 6 month back on the 12th. Right on. We’re fully in the traveling groove and we are loving it still...not anywhere near wanting to go back to the USA (seems to be a hot question lately). We are excited we’ll be in South America soon...we will probably start moving a lot faster once we get down there...but we would still love to have visitors! Numerous people have expressed interest in Macchu Picchu. We’ll probably be getting there around late October/early November (can’t hint any stronger than that). Note #2: We left Boquete 4 weeks ago and arrived in Panama City back on the 14th. I want to take a second to publicly thank Paul and Jenny Saban for a wonderful experience at the Paradise Gardens. Thanks to everyone who made our time in Boquete a blast. We probably took about 400 pictures during our month there...they have all been posted for those who wish to take a look (too many to list, just scroll down for the links). Note #4: I had a bunch of trouble with the map of our path the last couple weeks and could not update it. The problem is fixed and it is up to date once again (still a glich if you don’t have the newest version of Explorer...no problems with Firefox). Note #5: Enough with all the links...this journal isn’t the greatest, but there’s a funny story in it, and there’s photographic evidence of the largest insect I’ve ever seen. Woke up pretty hung over from partying our last night in Boquete but decided we would leave after all. It was pretty weird to have to pack everything up after a full month of not having to worry about it. Truth be told, I thought I would be a little annoyed, but in the end, I really was ready to move on. 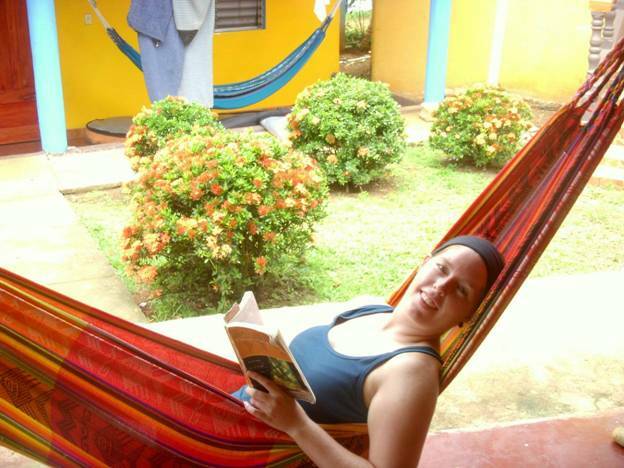 I don’t want to sell Boquete short...our experience was unforgettable there. We were very lucky to be able to stay as long as we did...but I missed being on the move. We were in no hurry to leave, so we had on last cheap lunch at a local place called Nelvis that I liked a lot (stop there if you make it!). Then we walked over to the main plaza and got on the bus to David. Just like that, after 5 great weeks that flew by, we were on the move again. We headed to Bamboo hostel when we got to David...it was a new place that had only been open for 2 weeks, so there was still a lot of work being done. The owner, Greg, was a young American guy that was a little nerdy but nice. They are putting in a pool and a bar so I expect this will be a great place in a couple more months. He still has a lot of cleaning to do though. He also has a couple dogs, which is fine, but there presence loomed over our two days there. First of all, he cleaned up his room and gave it to us since we wanted a double with AC and it was the only one available (like a said, they are still doing lots of construction). Well, we had a couple pillows but I think I got the one that the dog likes to sleep on because it was totally funkdafied. In the end, it was so bad I had to wrap it in a sheet. If you think that’s the end of our dog problems...just keep on reading. So we slept or a few hours and just layed around reading shaking off the festivities from the night before. Finally we walked up the road to find dinner, and ended up at this Chinese place that was decent. I know you thought I’d had it with Chinese food after Belize, but after a month in Boquete where options are limited, it was nice. On the way back, we found this store called Super 99. Wow! It’s easily the biggest and nicest store we’ve seen since San Salvador. It was like being back in the USA...products galore! I know it sounds weird but when you go hopping around the interior of Central America you forget about so many things that were common place back at home. I picked a few little things that I’ve been needing and then we headed back to the hostel and I basically just crashed on my dog pillow. We slept well, but the dogs, thinking it was the room they were supposed to sleep in, kept coming and scratching at the door all night. The main reason we had stopped for a day in David was to try to do some shopping. Jodi wanted to try and change out some of her clothes and we both needed to pick up some random items that we had used up or were missing. We got ready in the morning, but before we left, we had some cereal. The hostel had almost no dishes, but there were a couple huge bowls in the cabinet so we used them. They were made of stainless steal...hmmmm...I actually joked to Jodi, “These look like dog bowls”. Off we went to the Centro...there were tons of shops and we walked around for a few hours. Jodi even ended up finding a Yoga Mat, which is a surprisingly tough item to find down here. We had a good time shopping and even managed to meet some weird locals whose stories I’ll skip for now. We got back to the hostel around 5 or 6. I spent some time on the internet and Jodi met some of the new people that had showed up at the hostel. At some point, I decided I was in the mood for a cold brewski, so I went to the fridge to grab one. As I’m opening my beer, I slowly glance down at the floor to notice...dog food in the SAME FREAKING BOWL that I had used that morning to eat cereal! It can’t be, I thought...I checked the cabinets. Oh, it be. What kind of person puts the bowls they use for their dogs in the same cabinet as the regular dishes!!?? Damn this hostel! Damn these dogs! That’s officially the most disgusting thing that’s happened on this trip. I might never get over it. We ended up watching the movie, “Into the Wild” on my laptop that night. It’s based on a true story that’s pretty interesting. The concept appeals to the traveler in me and I get asked by a lot of people if I’ve seen it so I’ll put in my two cents. I liked it...I understood where the guy was coming from, but it was definitely a bit extreme. I think cutting yourself off completely from your friends and family (and burning your money!) is a pretty dumb move, (atleast he eventually realized that in the movie) and going out into the Alaskan wilderness with no knowledge of the area and almost no supplies is downright suicidal. There’s a fine line between adventurous and stupid...I think he crossed it. It’s also worth mentioning that the soundtrack is really good...any Pearl Jam fans will love it as it is all a bunch of Eddie Vedder songs recorded just for the movie. I was up most of the night using the internet. We were headed to Santa Catalina the next day and I wasn’t sure what the internet situation would be there so I wanted to use it as much as possible. We were actually there back at the beginning of ’07 and we both loved it and were looking forward to going back and being able to stay for more than 2 nights. Finally crashed around 3. We got the bus from David to a town called Santiago and then another bus to Sona. We got to Sona at about 5:00, but the last bus to Santa Catalina had left at 4:15, leaving us with two options: 1) Pay $30 cab ride and get to Santa Catalina that night or 2) Pay $11 for a hotel room and go the next morning. That was an easy one. We walked a few blocks and found the only hotel in town...it was not exactly the Hilton but it was more than decent enough for one night. We had to catch the bus at 5:00a.m. the next morning anyway. We went out to find a little food and walk around Sona. There really wasn’t much to it...I’m sure almost no foreigners ever come here except to catch the bus to Santa Catalina. We found a cheap meal in a small restaurant that was next to a large Cantina. After we ate, Jodi went to an internet place in town and I headed for the Cantina. It ended up being a cool experience...I chatted it up with the local guys for about an hour, talking about tons of different things. I think that it was interesting for them to get a chance to talk to a foreigner. Certainly the few that do end up staying in Sona for the night wouldn’t go into the Cantinas, and even less likely would be able to communicate with them. These are the kinds of things I love doing when traveling in these random places...I like to get out and interact as much as I can with local people. I love hearing their stories and learning about their lives. It’s a good example of how being able to speak the language can open up more experiences for you. After about an hour, Jodi showed up at the bar and we ended up staying for awhile. It’s tough for me to describe what the Cantinas are like in the interior of Panama. They don’t necessarily look that inviting...they are basically like a large, one room salon from the old west except with a cement floor and a few plastic tables and chairs strewn about. There are usually only men in them...in fact, we had been told back in Boquete that women weren’t even allowed inside. That was not the case in Sona...and although Jodi was the only girl in a room of about 30 drunk guys, everybody treated us great. We had fun and it definitely didn’t hurt that the half liter beers were only 75 cents. It was tough but we finally left there...just getting to hang out in the Cantina for a bit made the stop over in Sona worth it. We got up at 4:30 to catch the 5:00a.m. bus to Catalina. After the two hour ride we got there and we immediately went to Cabanas Rolo, where we had stayed when we were here in ’06. We had to wait awhile for them to clean a room for us but we got in okay. We were both really tired for some reason so after we got our room we ended up sleeping until like 11. After we got up and had lunch, we went on a long walk to Playa Esteros. We didn’t even swim in the end, we just ended up talking for a few hours...about our lives back home and our lives in Boquete and just whole bunch of different things. I know it seems weird, but afternoons like that are still pretty awesome. It was one of those ones where 2 or 3 hours pass and you don’t even know it. You look up and you’ve walked miles without realizing. That’s part of the complete freedom of the traveling life I suppose. At somepoint when we go back to “regular lives”, I’ll miss the carefree afternoons like that more than anything. That night at the hostel we had a bunch of drinks and ended up talking with all the other people that were staying there. Pretty much everybody there was there was a surfer...including these two Spanish guys that were staying there for a whole month. One of them really got under my skin...I’ll spare everyone the details, but trust me, I was infuriated. Once again...99% of the people you met in the hostels are great...but occasionally you get somebody who is so angry at the world that you wonder why they even bother to travel in the first place. We stayed there for a couple more days and I barely said a word to the guy. It was the fly in the ointment of an otherwise good night, and despite it, we were happy to be in Santa Catalina again. Well, the original goal today was to get up and go surfing. Somehow that morphed into to sit in hammocks and read all morning and afternoon. I ended up working on organizing our pictures on my laptop. The only time we even left the hostel all day was to go and find some lunch. We really made a mistake by not buying some groceries in Sona when we had the chance. There are two stores here in Santa Catalina and to say they have a minimum of supplies would be an understatement. The selection is about as good as that of a small gas station back in the US. We were lucky to find a frozen package of bologna, but sadly, bread was nowhere to be found. We ended up making sandwiches with these crumbly biscuit-type things. Not one of our better meals. Anyway, I spent hours that day organizing all the pictures and videos we took in Boquete! I can’t believe how many there were! If we get them captioned I’ll post them up with this journal. Not much else happened at all that night...we ended up having a couple beers on the porch with a cool couple from Washington state...somehow we got on the subject of state capitals, always one of my favorite games to play. I was upset when the guy got Missouri though...damn...nobody ever gets that one! We went down to the dive shop around 8:00. 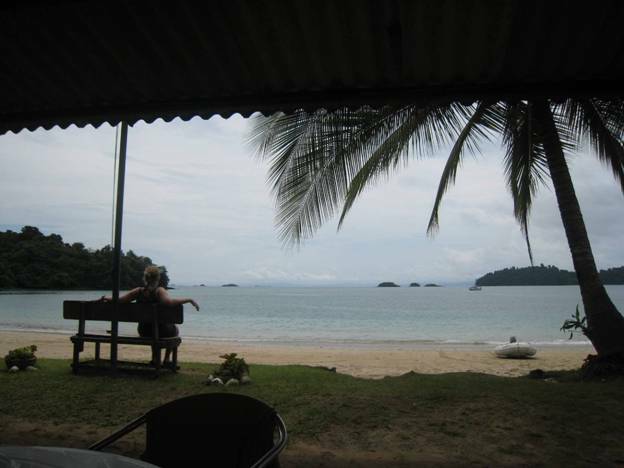 We were going to do a snorkeling tour all day, that included a stop at Isla Coiba. We ended up on the boat with 3 other tourists, Laura/Massachusettes, Jo/Massachusettes, and Andrew/Panama. They were all going diving actually, but we dive spot and the snorkeling spot was the same. We had chosen to snorkel, which was still $75 (including a $20 entrance to the park) because it was half the cost of doing the dives. Of course, diving is more fun, but it seemed like way too much to spend for only a two tank dive. 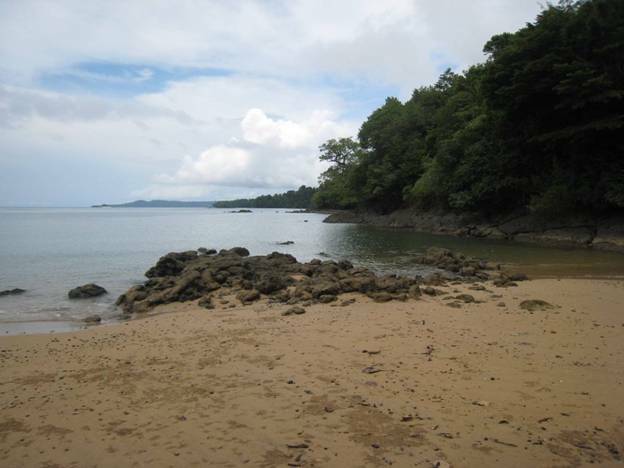 Plus, one of the main reasons for taking this tour was really to go to Isla Coiba. It took us about an hour to get to the first site and the ride out was beautiful! You pass by tons of small islands and get a look back at the beautiful coast of Panama. It was one of those times where we were so enraptured in the beauty of it all that we forgot to take any pictures. The sea was calm and we spent a lot of time talking with our new friends on the boat. Laura was an oceanographer and had an awesome job where she got to travel all around the world, diving and studying animals in different places. When we got out to snorkel, the current was pretty strong. It was a little tough to swim against, but we quickly adjusted. The visibility in this area was as good as we have seen. There were tons of fish at this site...especially there were large schools of damselfish, which are some of my favorites. I also so a nurse shark from pretty far away and there were a few new fish we had not seen before. We had a great time snorkeling around some rocks, but I’d be lying if I didn’t say I was a little jealous of the divers. After the first snorkel stop, we went over to Isla Coiba...it probably took another 20 minutes or so. The island was actually quite beautiful...even though we only really got to see a small portion of it. They could have called it Isla Iguana, because there were Iguanas all over the place...some of the biggest ones we’ve seen. We went on a short walk down a muddy path that ended up putting us out on a little beach. We were hoping we would be lucky enough to spot some scarlet macaws in their natural habitat but it didn’t happen. We did see a few birds that we had become familiar with back at the paradise gardens. The little walk itself was nothing that spectacular and the joke was on us in the end anyway...we could have just walked straight along the beach from the visitors center and avoided getting all muddy. We had a little lunch on the island and also visited the museum they had, that was surprisingly good. Jodi found a bench to relax on afterwards and I got this great picture of her. They actually had a couple of cabanas on the island where people could stay over night. There’s nothing over there though and only really a couple trails you can hike on...it would be a nice night in a secluded paradise though, but we didn’t mind just being there for a couple hours. After we left the island we went to another snorkel spot and it was amazing! We saw plenty of fish again and we saw two really big sharks...a nurse shark that was probably about 12 feet long and a white tip reef shark that was not too much smaller. They were much bigger than what we had seen in Belize and we got pretty close. We also saw the hugest eel! I didn’t know they even got that big. Too bad we didn’t have an underwater camera, because there would have been some really good pictures. I also spent a bunch of the time doing some free diving...which I’m getting pretty good at. I remember back in Cozumel that we were amazed that the snorkel guide dove down to 40 feet...that doesn’t seem like so much of a feat to me now. Overall, the snorkel tour and the trip to Coiba was pretty awesome...it was a little bit expensive but going over to the island is a highlight of this area of Panama. That night we didn’t really do anything...we had a few beers at the hostel and went to one of the few restaurants...an Argentinian place called Los Pibes for dinner. The place had spectacular burgers! We were absolutely the only ones there though...but there are not many people here at all this time of year. 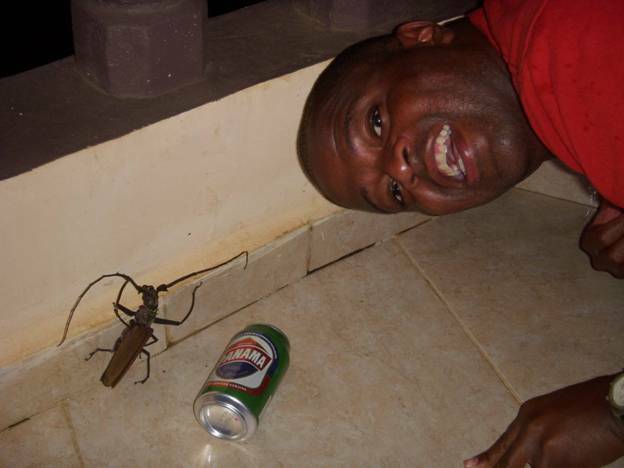 Back at the hostel, we hung out with our friends from the snorkeling tour...it was a pretty cool night that would have been completely chill if not for us discovering one of the largest insects I have EVER seen (notice the beer can in the picture for a size reference)! That thing is ridiculous...and to make matters even worse, it could fly! Damn, even looking at that picture again now it is hard to believe. It actually landed on me at one point...let’s just say I’m glad there’s no existing video of my reaction:) The only good news is that it was too big to fit under our door! We had wanted to go surfing in the morning but it was raining a bit. We just hung out reading most of the morning and went to breakfast down at the restaurant. It got pretty sunny in the afternoon so we decided to head to Playa Esteros to try and surf. It was about a 30 minute walk from where we were staying and we had no desire to lug a surfboard that far...luckily I remembered seeing surf boards for rent at Los Pibes Restaurant the night before. That place was probably almost 3/4 of the way to the beach and made the walk a lot easier. The walk to the beach was uneventful except for two things. One was that we ended up getting a stray dog friend to follow us for the day. We named her Molly and she was probably the most playful stray we’ve encountered. I do kind of like it in the beach towns when a dog follows you around for the whole day...as long as they aren’t mangy. This dog really liked us...not only did she follow us from town all the way to the beach, but we had to cross a small river to get there and she swam right across with us. She hung out there for hours while I surfed and then went all the way back to town with us. Anyway, surfing didn’t go the greatest...I had a really hard time catching the waves and was barely only able to stand up once. It’s weird, I was pretty consistent back in San Juan Del Sur...maybe it was the waves, or maybe it was that the board was longer. Anyway, I’m determined to get decent a surfing and I will even if it kills me! Our last night at the hostel we just chilled. Oh, by the way, if you didn’t already do it, now you can go and look up the capital of Missouri.